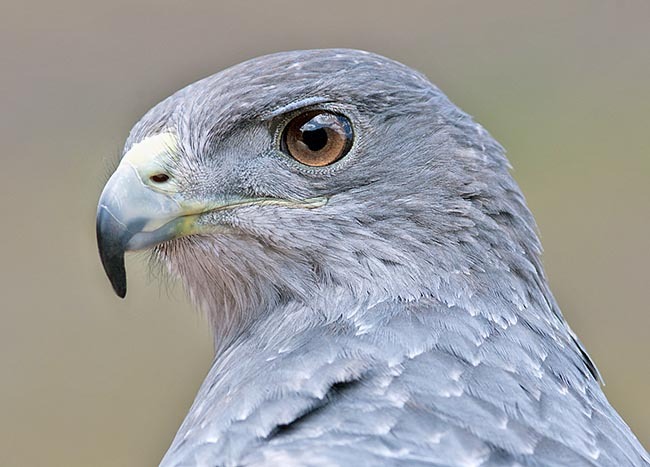 The Chilean blue eagle (Geranoaetus melanoleucus Vieillot 1819) is a huge eagle of South America commonly called also with other names: Black-chested buzzard eagle, Black buzzard-eagle, Grey buzzard-eagle, Eagle-buzzard. – the Geranoaetus melanoleucus australis (Swann 1922). The species was previously assigned to the genus Buteo and even if having greater affinity with the genus Buteogallus and Leucopternis in respect to that it was belonging, has deserved the classification in a separate genus. The name of the genus “geranoaetus” comes from the old Greek “géranos” “γέρανoς” = crane + “aetos” “ἆετός” = eagle. The reference to the “crane” is due for the grey wings and the noisy vocalizations it emits. 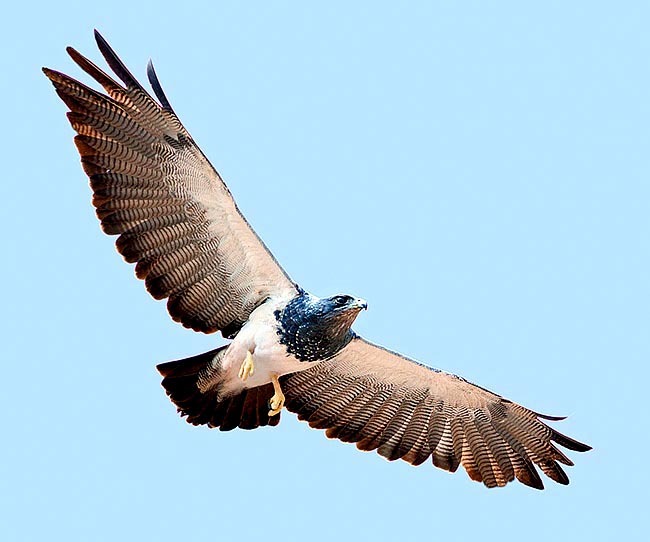 The name of the species “melanoleucus” comes from the old Greek “mélan” “μέλαν” = black and from “leukos” “λευκός”= white and refers to the contrasting colouration of the eagle when seen from below. The two subspecies of Chilean blue eagle live in two separate distribution areas of the South American continent: the nominal subspecies Geranoaetus melanoleucus melanoleucus is distributed from south-eastern Brazil (Alagoas, Rio de Janeiro and Sao Paulo) to Paraguay, to eastern Argentina (north of Buenos Aires) and in Uruguay; the subspecies Geranoaetus melanoleucus australis is distributed along a very long vertical stripe starting from north-western Venezuela (Mérida, Ande) and crosses the west of the whole South America reaching the Tierra del Fuego. This raptor lives mainly in the mountain areas in the northern part of its range; at 1600-3500 m of altitude in Colombia, occasionally up to 4600 m in other areas. It frequents also the plain of southern Chile, in Argentina and in Tierra del Fuego where it live in different habitats: grassy hills, steppes, valleys, beech forests (genus Nothofagus) up to 2200 m of altitude in Chile. The Chilean blue eagle is about 62-80 cm long with a weight of about 2000 g (1700-3200 g), has a remarkable wingspan of 175-200 cm. The wings are very long and ample, when the wings are closed, the tips intersect at X. The tail is short and is wedge-shaped; when flying the open tail looks like a short “crescent” recessed back between the wings. For what the livery colouration is concerned, head, back and chest are slate grey-bluish with soot brown shades, the fore-throat is more nuanced of clear and the chest is more blackish and spotted of white. After the dark chest, the rest of the ventral part is white and often (but not always) finely barred in dark. The shoulders are ash grey finely barred of black as the flight feathers which present, however, a little darker grey shades, the great coverts of the wings are even darker and form as sort of nuanced line by mid wing. The tail is black with a narrow terminal stripe of very pale grey/white colour more evident on the lower side of the same. The sexes have similar colours but the females are decidedly bigger. The subspecies australis is smaller than the nominal and has always some bars on the white ventral part. The immature individuals have a brown-dark reddish colouration, do not have the shoulder barred in grey as the adults. The other drawings of the livery are fawn white/leather coloured, the chest s heavily striated in black; abdomen and thighs are barred. They need some years (4-5) before getting the plumage of the adult. It mainly nourishes of mammals, equivalent to the 95% of the total of the seized preys. The most hunted species are the Degu (Octodon degus) and the European rabbit (Oryctolagus cuniculus). The last one amounts to the 44% of the total preys and for this reason the Chilean blue eagle is very useful for the local agriculture. It can eat also some species of birds, such as the Burrowing owls (Athene cunicularia), the Chilean tinamou (Nothoprocta perdicaria) and the Guans (Penelope spp.). It does not even disdain the carcasses. Seasonally, it predates also insects and, at times, snakes and lizards. It can even kill good sized preys such as the Grey fox (Lycalopex) and the Patagonian skunk (Conepatus). This raptor is more active by mid morning and in the afternoon when the heat creates the ascending currents favourable for the flight. In winter, it spends considerable time fluttering in pairs on the mountains and along the slopes for detecting, more easily, thanks to the scarce vegetation, the potential preys. 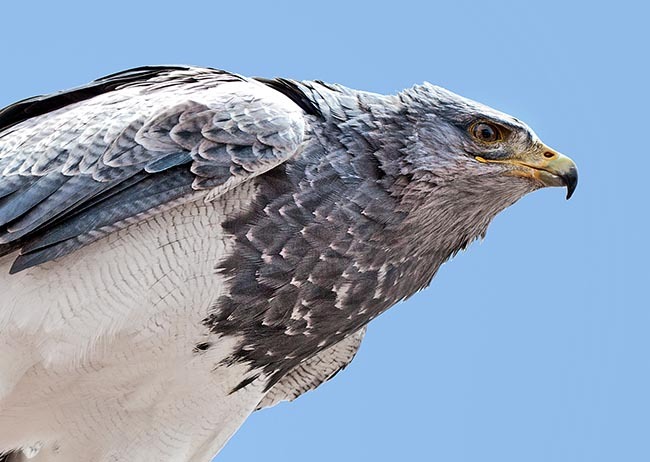 The Chilean blue eagle reproduces all the year round in Ecuador; nests from November to January in Chile and Argentina, from May to August in Peru, from March to July in Venezuela, some young have been sighted from April to July in Colombia. This eagle often nidifies on the cliffs and the crags, often very high. In other zones, it nests on the tops of very high trees or, if these are not present, on cactuses. It adapts to nest also on low bushes or even on the ground. The nest, usually, has a diameter of 80-90 cm. Sometimes, it reutilizes the old nests but much more frequently builds it new. The pair performs courting flights and copulates for at least two weeks before laying. The brood is usually formed by two eggs (1-3) and the incubation lasts about one month. The chicks come to life with a white down. The species is fairly common in its own distribution range. As it nourishes also of carrions, reaching the point to contend them to the large Andean condor (Vultur gryphus), it may be victim of poisoned baits used for fighting the so-called harmful animals! This species, seen the bright and intelligent behaviour, is utilized in falconry. Buteo fuscescens (Vieillot, 1819); Buteo melanoleucus (Vieillot, 1819); Spizaetus fuscescens (Vieillot, 1819); Spizaetus melanoleucus (Vieillot, 1819).